I mentioned a while ago that I’ve gotten lazy. The summer sun snuck into my bones and sapped my drive. “I’ll write/sub/be a creative person later,” I thought. I’m happy to report that I’m currently back on track. WOO! I wrote down all of my deadlines so I could see them. I blocked out tiny chunks of time for writing, and (this is the hard part) I’m sticking to my schedule. I’ve been keeping snippets of inspiration in a folder to refer to whenever I need. I’m even sitting at my desk instead of merely spinning around in my chair. It’s awesome. Then I noticed something: every single time that I sit down to write, something happens. The phone rings, or somebody comes to the door, or, oh, I don’t know, a DVD player suddenly FALLS FROM THE SKY and gashes Tiny Daughter right between the eyes. Cue blood. Cue an ER visit to get four stitches, all neatly contained under half a Hello Kitty Band-Aid. Cue abandoned laptop with a lonely, blinking cursor. She’s fine and even scored an ice cream cone out of the deal. The DVD player has been thoroughly chastised. And after everybody went to bed, I stayed up and wrote and entire chapter. TAKE THAT, UNIVERSE! Do you find that you’re constantly interrupted, too? Tags:cursed, overcoming adversity, TAKE THAT UNIVERSE! Ouch! I’m glad she’s okay. Seems like everyone is getting a bit lazy during the summer. It’s good to see some get back on track. 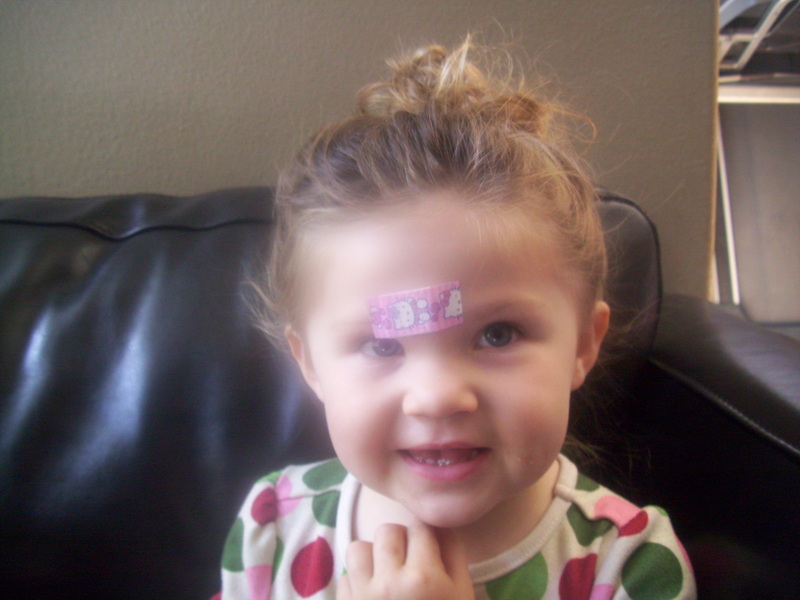 Poor thing…my oldest has a Harry Potter scar from when she was about that age. The good news: if you were raising her 80 years ago, instead of a DVD player it could have been a zeppelin or a cow that landed on her. Or Teddy Roosevelt. Am glad your little girl is okay. I have a very short concentration span so am easily distracted myself, let alone distractions from other people. Kids are like magnets for injuries, I swear. She is absolutely adorable by the way…boo boo and all. Congrats on the new chapter!! I’m not convinced it was the DVD’s fault – I suspect gremlins. Thanks, Andrea! It’s good to be (somewhat) productive again. I feel like my old self. Jeremy, I will forever be grateful that Teddy Roosevelt didn’t fall on my daughter. Way to look on the bright side. Simon, I’m whipping your tail with glee, EVEN AS WE SPEAK. Kinda. Not literally. Sheesh. Danielle, I KNOW! I’m writing along okay and then suddenly I’m all, “Gasp! I need to look at http://www.failblog.org!” or whatever it is. Throwing other people in the mix just makes it worse. Cate, you have no idea. I gave myself a deadline and suddenly the universe rose up against me. Gremlins are my best guess, too. Lua- Fie, world! Fie! Let’s wish it away until our writing is complete! I am constantly interrupted…totally feel for you…glad the cutie is ok…and that you banged out that chapter…more than I can say for myself, and I didn’t have flying electronic equipment bar my way either. Sheesh! Best of luck with your schedule. It IS so hard to find the time. I think that’s when you find out who is going to stick with writing for the duration…they are ones that keep doing it in spite of life’s many interruptions. Good luck!